As a pioneer in the construction and connection technology of power modules SEMIKRON presented the world's first insulated power semiconductor module with bipolar chips in 1975. This construction was followed by a number of innovative developments. 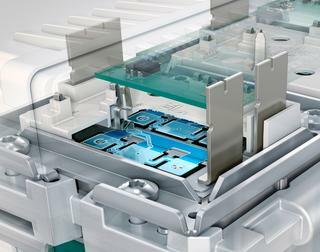 The first IGBT based standard module followed in 1989. Today the construction is still closely related to the original set-up. One or more ceramic plates DCBs (Direct Copper Bond) are soldered onto a copper base plate, which also serves as the mounting surface to the heatsink. They consist of a thin insulating substrate made of Al2O3 or AlN and copper coated on both sides. Soldered to the top of the DCBs are the bottom sides of the chips (IGBTs: collectors, diodes: usually cathodes). The chip tops (IGBTs: gate and emitter, diodes: anode) are contacted by parallel Al bond wires to corresponding pads on the DCB substrate. Soldered directly onto these pads are either the module terminals or there are more soldered or bonded connections to terminals mechanically fixed in the module housing. The continuous development of the construction and connection technology of power modules is driven by cost measures in production and processing of the modules on the one hand and ever increasing demands on the module properties on the other. This involves the best possible dissipation of the heat loss in the semiconductors to the cooling, both statically as well as for short-term loads. Power modules can be utilized very effectively with efficient cooling, which is a "must" for high power and lowest possible semiconductor cost. 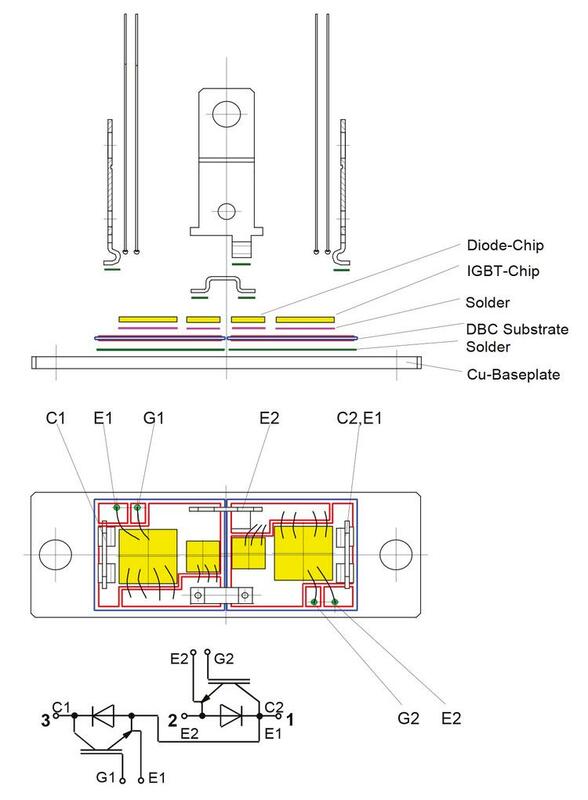 Thus the permissible temperatures of the IGBT and diode chips is increased from one chip generation to the next. 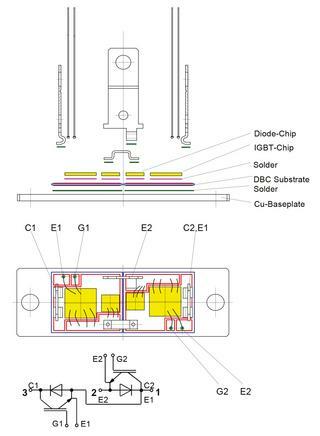 However, high chip operating temperatures and efficient heat dissipation tighten the requirements for temperature and power cycling capability of the module designs. This requires continuous development of the construction and connection technologies. With the technologies described below SKiiP®, SPRiNG®, SKiNTER® and SKiN® used in power modules successfully positioned in the market SEMIKRON is one of the pacemakers of this development.